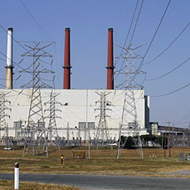 TVA is replacing the Allen coal plant (above) with a new gas plant, and they're looking at drilling wells into the Memphis Sand aquifer to cool that new plant. The Shelby County Health Department has already issued three permits to the Tennessee Valley Authority (TVA) to drill wells into the Memphis Sand aquifer to access cooling water for its new gas-powered Allen Combined Cycle plant. Two more permits for wells are being considered, but at a Shelby County Commission committee meeting on Wednesday morning, Commissioner Steve Basar asked the Health Department not to issue those permits without coming to the commission first. Basar and Commissioner Heidi Shafer also recommended the formation of a committee that would look at updating the codes for drilling wells into the aquifer — the source of the region's drinking water. "What was acceptable 10 to 20 years ago may not be acceptable now. 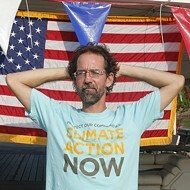 We need to evolve and move on and change the way we're doing things," Basar said. At that meeting, Bob Rogers, manager of the Health Department's pollution control program, told the commission that current codes say that if a company or resident wants to drill a well and has the proper design and installation plan, the department generally issues a permit. He said there are some restrictions, including a restriction on water use for non-circulating systems, meaning the water is used and discarded. 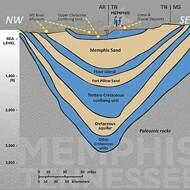 At issue are the permits TVA has requested to drill into the Memphis Sand aquifer for up to 3.5 million gallons of water per day to cool the new, under-construction gas plant. 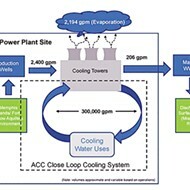 In 2014, when the TVA approved plans for the Allen Combined Cycle gas plant that will replace the Allen Fossil coal plant in 2018, they said they'd be using wastewater from the nearby Maxson Wastewater Treatment Plant for its cooling water system. But those plans have turned out to be too expensive, according to a report from TVA, since using wastewater would first require treatment due to pollutants in that water. The TVA looked a few alternatives — either drilling five wells into the aquifer and pulling water directly from the ground, purchasing potable water from Memphis Light, Gas, & Water (MLGW), or some combination of the two. If potable water is purchased from MLGW, that water would come from both the Memphis Sands and the Fort Pillow aquifers, but the TVA environmental assessment report says MLGW cannot sell the TVA enough water to meet peak demand. The TVA published a supplemental report on those proposals in April, but the entity did not seek public comment. That's not required by law, but TVA did seek comments for its original report detailing the options for switching from a coal plant to a gas plant. Scott Banbury, conservation program coordinator for the Tennessee Sierra Club, spoke at the county commission meeting, and he said those new codes should include public notice for drilling permits. At a Sierra Club-hosted panel discussion on the issue in August, MLGW President Jerry Collins told the crowd that if TVA had to take water from the aquifer, he'd prefer the entity buy potable water from MLGW rather than pump directly. Either way, it comes out of the aquifer, but Collins said a purchase from MLGW would allow for more oversight. "That would keep your rates low, and we could monitor how much they're using. 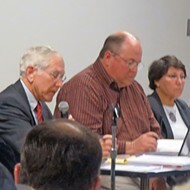 Also, we take out the iron and add phosphate, which makes it much less corrosive," Collins said at that panel meeting. At the Shelby County Commission committee on Wednesday, Tyler Zerwekh, administrator of environmental health services for the Health Department, revealed that the department has issued 25 well permits in the past 12 months, and that includes wells for residential and industrial use. In total, there are 841 quasi-public wells (meaning at least some of the water is for public use) in 641 locations. That does not include wells for residential use.